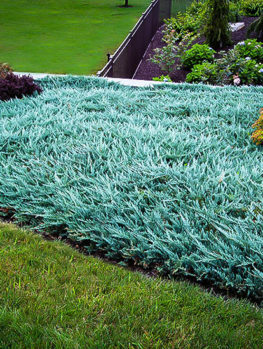 No garden is complete without groundcover plants. These tough but attractive plants cover the soil beneath your other plants, or in difficult areas of the garden where not much else will grow. They often have attractive colored flowers and foliage, and they extend the season of interest in your garden. There are suitable plants for every part of your garden, from deep shade to hot, dry sun, and for damp places too. There is an entire world of plants that stay low, and spread beneath taller shrubs, turning bare, brown earth into a carpet of green. Many different plants can be used as from dwarf flowering shrubs to creeping succulent plants. To be used for this purpose, there are several qualities we look for. Suitable plants should grow no taller than about 12 inches and spread wider than they are tall. They should be evergreen, or at least leafy for much of the year. Attractive foliage, that stays healthy and creates a lush look is vital, and the ability to create a dense covering, that will resist the invasion of weeds is a desirable feature too. 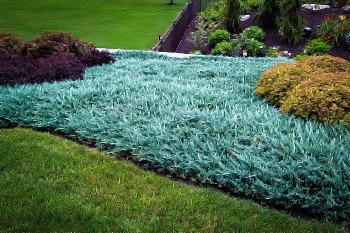 If they have flowers at some time of the year, then all the better – we can always use some extra color in our gardens. The best plants will grow in difficult areas – those shady places, in damp spots, or in dry, sunny places. They should grow quickly, but not become invasive and hard to control. They should have few pests or diseases, and not require constant care and attention – they should be very low-maintenance. If you have spaced out your trees and shrubs correctly, as they grow they will meet and touch, giving you a more-or-less continuous flow of foliage. But most shrubs are several feet tall at least, and beneath them open space quickly develop. This is a place where weeds can grow, and even if they are controlled, you are looking at bare earth. Perhaps you have put down mulch, but while that is a good idea, it can give your garden a rather sterile look. If your shrubs come up to a path or driveway, that last few feet can be particularly bare looking. When we look at nature, we see just the opposite. Plants mingle together, and small plants fill the spaces beneath larger ones. This natural look is the inspiration for using low growing plants to cover areas of soil. If we choose suitable plants, we can clothe that bare earth with green, and add a whole extra dimension to our planting. When our shrubs are not flowering, then these small plants will bring interest, and make our gardens more alive and vibrant. As well, with the wide variety of plants we usually grow in our gardens, broad areas of a single plant unify the look of your garden, tying it all together, and binding the different elements into an attractive whole. We use groundcover plants in a variety of ways around the garden. Here are some ideas. Once your shrubs have grown a little, there will be open ground beneath many of them. Weeds can grow there, and the earth looks bare and dull. Instead we can grow spreading plants beneath them, creating a carpet of green, conserving moisture, and reducing weed growth too. Very often these plants will even hide falling leaves, reducing or even eliminating that tedious chore of raking them up. It is best not to plant taller shrubs too close to the front of a bed, as they will get in the way of using paths and driveways, or hang over lawns, killing the grass. This means that we usually plant in a way that leaves the first one or two feet of a bed empty. Yet that area is very conspicuous, and really does need attention. A low spreading plant is the ideal way to fill that plant without getting in the way. It will bring interest and color – completing your bed layout beautifully. Shade is always a problem, because so few plants grow well in it and carpeting shady spots beneath trees or larger shrubs is probably the most common need around the garden. Luckily we have a selection of tough plants that will do the job perfectly. The result is a carpet of green, instead of a desert of soil and dead leaves. Hot, dry areas, especially if the soil is shallow and sandy, are always hard places to fill with plants, and yet they are often right out on display. You can eliminate these dull eyesores by planting suitable low-growing drought-tolerant plants that will bring foliage and flowers, thriving where nothing else will grow. Is a garden, we can easily end up with a small area of lawn that is too small to look attractive and yet still needs mowing regularly. The result is not worth the on-going effort. It might also be too shady or too dry for grass to grow well, so these spots just look drab and sad. If they don’t have a lot of foot traffic, groundcover plants are a much better solution. They will stay low, like a lawn, but need only minimal attention. For less work you get much better results, and that boring spot becomes a place of interest and beauty. These plants are easy to grow. They have in a way been ‘pre-selected’ for that, since these are all tough, low-maintenance plants that thrive even in difficult locations. Once established, most need no particular care, and many are very drought resistant. They are usually not affected by any significant pests or diseases, so adding these plants to your garden improves its appearance enormously, while adding almost nothing to its maintenance. In fact they often save work weeding and raking. It is important to choose the right plant for the conditions you have. Even in sunny areas the space beneath larger plants is often shady, so that must be considered. Most of these plants are shade-tolerant, but there are also plants suitable for hot, dry places. Lower down you will find all the information you need to choose plants that are very suitable for your needs. The areas for planting usually need some soil preparation. This will create a place where the plants can become established without having to compete too much with the roots of trees. Once established these plants are able to survive even in areas with a lot of tree roots in the soil but giving them a helping handing getting established is an important step to success. Spacing is the single most important consideration when planting. When planting in a row, for an edging, or when covering a piece of ground, space the plants about two-thirds of their maximum spread apart. This will create a dense mat of foliage, which will give you the best appearance while also reducing or eliminating weed growth. For example, if a plant has a spread of 18 inches, space your individual plants about 12 inches apart when planting. For groups, don’t plant in rows, but scatter the plants over the area. This creates a more natural appearance, which is the look we mostly strive for with these plants. Many different plants are used, drawn from many different plant groups, so their appearance is very variable. 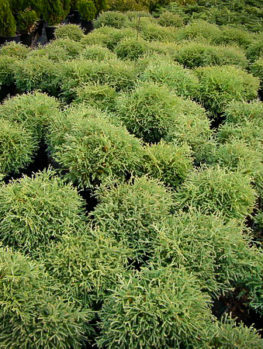 Most are evergreen, and most have a trailing, spreading or mounding appearance. They usually grow just a few inches tall, but spread at least 12 inches in every direction, and often more. Many have trailing stems, covered with leaves, that root into the soil, increasing the spread and density of the plants. The best choices are not invasive, and they can easily be trimmed to keep them where you want them to be. 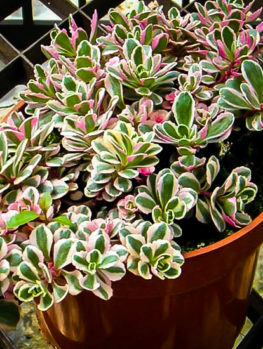 Many of these plants have attractive foliage colors, although other very effective plants simply have glossy green leaves. Some have flowers, usually in spring or summer, and some flower for extended periods of time. You can choose plants with foliage and flower colors that complement the color scheme you already have in your garden, and these plants can be important ways to bring extra color into any garden, especially a small one, without needing more planting space. With so many different plants to choose from, the best way to learn more, and to find suitable plants for your particular situation, is to look briefly at some popular plants. Here is a summary of some top choices, followed by a brief description of them. Much more detailed information can be found on the relevant pages of our site. Different varieties of Lily Turf are popular and reliable groundcover plants in all the warmer parts of the country. Although looking like a broad-leaf grass, these are not grasses at all. The most popular forms are Royal Purple Lily Turf (Liriope muscari ‘Royal Purple’) and Variegated Lily Turf (Liriope muscari ‘Variegata’). 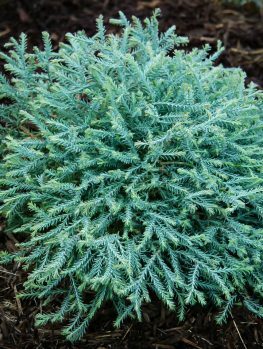 The first of these has foliage of a rich purple color, topped in late summer and fall by spikes of blue flowers, that add a whole extra color dimension to fall. The second one has striking foliage of deep green, with a white band down either side and more lines of white down the center. It too has blue flowers in fall. Both these plants are excellent cover for sheltered parts of zone 6 through to zone 10. They thrive anywhere from full sun to shade, and they make beautiful carpets of color beneath larger shrubs, or as a broad edging to your beds. Many types of Nandina, or sacred bamboo, are tall shrubs, but some modern varieties grow hardly more than 12 inches tall, and they make great groundcover plants from zone 6 on. These plants have finely-divided foliage, and there are several dwarf varieties that are suitable for filling broad spaces. One of the most attractive is the Flirt Nandina (Nandina domestica ‘Murasaki’). 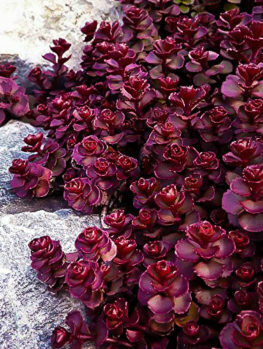 This lovely dwarf plant has foliage that is wine-red almost all year round, and it grows anywhere from full sun to full shade. Just as shade-tolerant is the Firepower Nandina (Nandina domestica ‘Firepower’). Its glossy green leaves turn rich red in fall, and stay that way all winter, until the new spring growth comes. Wherever you need a slightly taller plant to fill blank areas, say in a larger garden, or beneath tall plants, mass planting of Nandina is sure to give you the perfect result. 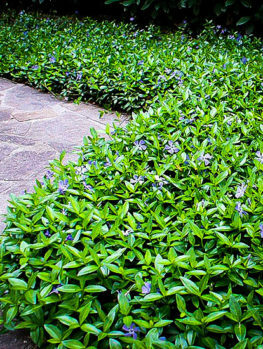 In cool and cold parts of the country, periwinkle is the groundcover of choice. 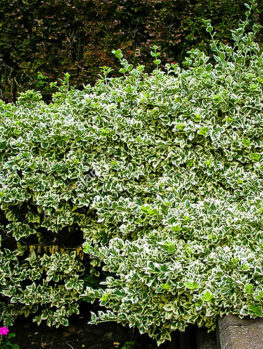 This tough and hardy plant will cover large areas beneath trees and shrubs with a weed-proof mat of glossy green leaves on trailing stems. Every spring, and sporadically through summer, open flowers in a perfect sky-blue color cover the foliage, making a wonderful display – before most of your other plants have even started to flower. 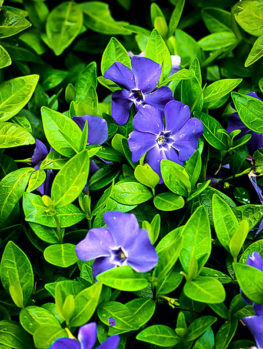 The most popular and reliable form of this plant is Bowles Periwinkle (Vinca minor ‘Bowles’s Variety’), which is hardy right down to zone 4, and even lower with good snow cover. It forms wide mats of foliage up to 5 feet across, that root in the soil as they grow. It is easily trimmed back, so it is not invasive. It thrives even in deep shade, so it is especially useful if you have a garden with many trees. 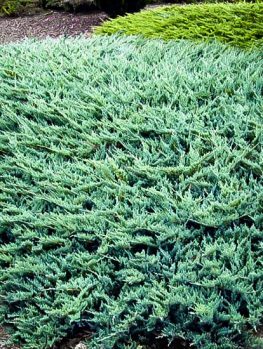 You can say goodbye to bare earth once you plant this lovely trailing evergreen. It does best in soil that is moist, especially in spring when the new growth forms. 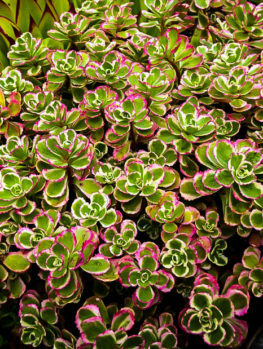 There are many garden plants called sedum, but the best for low growth is the creeping stonecrop, Sedum spurium, which is low-growing and available in several forms with attractive colored foliage. This is the top choice for all those hot, dry spots around the garden, as it will grow in almost no soil at all, filling cracks between stones, and turning bare, dry areas into carpets of color. 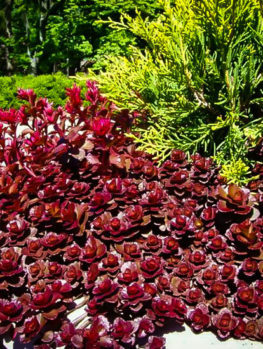 Two of the very best are the Tricolor Sedum, which has leaves splashed with green, cream and red, and the Voodoo Sedum, with rich red foliage. Both of these plants have bright flowers too, either bright pink, or in the Voodoo Sedum, bright red. These cover the plants in summer, making a brilliant splash of color. Growing just a few inches tall, but spreading sideways a foot or two, you can quickly cover those sunny spots with these plants. They are hardy all the way from zone 3 to zone 9, so wherever you are you can enjoy this very easy plant, that will grow almost anywhere there is sun. Coming from the woods of Japan, the different forms of wintercreeper (Euonymus fortunei) all make terrific groundcover in shady places. 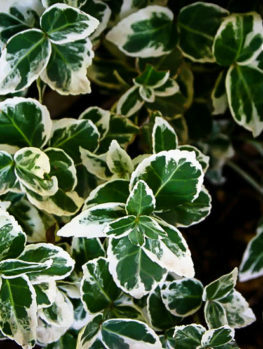 By far the most popular is the variegated variety, called Emerald Gaiety Wintercreeper, which has glossy green leaves splashed and marked with cream and yellow. It spread sideways, and even upwards onto walls and trees if you want it to. For larger areas it is ideal, since it can spread 3 to 6 feet wide. If it starts to grow too tall, just trim it like you would a shrub, and you can keep it low and ground-hugging easily. It will grow anywhere from full sun to full shade, and it is hardy from zone 4 to zone 8. Since these plants are often placed beneath other larger plants, it is important to prepare the soil well. It should be dug over and enriched with organic material. Once established these plants will thrive will very little care, but good soil preparation will have them get started, which is important for future success. When planting, water the pots the night before, and the planting area too, if it is dry. Dig a hole for each plant, remove the pot and place the new plant in the hole at the same depth it was in the pot. Replace some of the soil, firm it down around the roots and then fill the hole with water. Let the water drain away and once it has gone, put back the rest of the soil. Water your new plants once or twice a week during the first season, and some liquid fertilizer will help them get off to a flying start. If you have chosen the right plant for the right place, once they are established, virtually no care will be needed. If necessary, trim spreading varieties back in spring to keep them where you want them, but otherwise they will usually take care of themselves. Although they should not be buried with leaves, in fall many leaves will simply disappear beneath their foliage. Not only does this reduce raking, the rotting leaves will help feed your plants.